So last night I talked myself into going for a run. Actually I ran last Monday too, although I don’t think I blogged about it (despite it being world news). 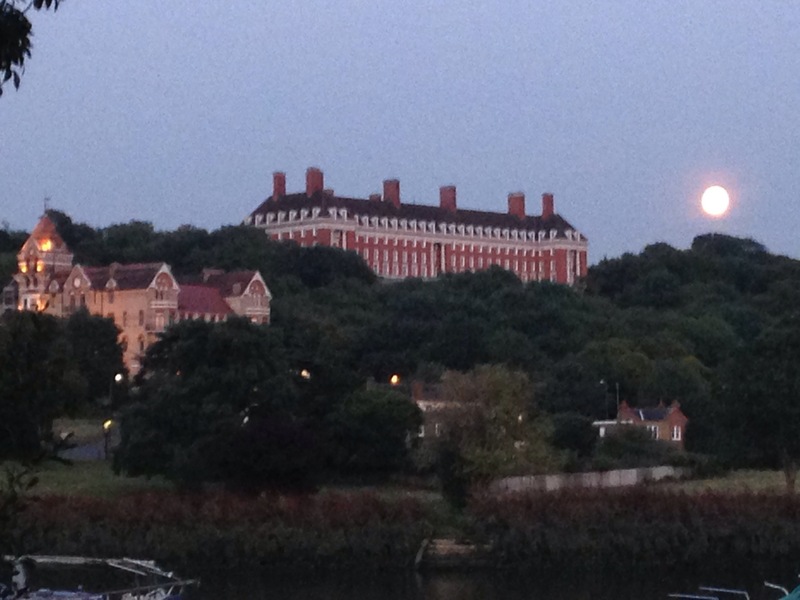 Anyway, I run along by the river towards Richmond, where I am greeted by the wonderful sight of the big red house on the hill. Last night the view was even more outstanding, as it had a big red moon to go with it. Today I ache, a lot more than last week, but it was worth it. I wanted to end this blog with a song about the moon, but I’m saving that for my next post. So instead I’m going to leave you with a bit of INXS, who kept me going on my run last night. While this blog is called 33 and Lost in Life, and you expect to hear the mumblings of a thirty-something as she stumbles her way through the journey of life, I have to be careful not to grumble too much. Suffering with depression, and now being off my anti-depressants (I’ll tell you about that another time) I am susceptible to bouts of downness. After a lovely weekend away with friends, I was particularly down at being back to reality. Yesterday as I headed home after doing some overtime at work and my weekly shop, I could feel the depression seeping in. My housemate was out, so the flat was deserted except for The Bish (my cat, Harry). I knew there would be trouble ahead if I didn’t do something. So, after unpacking my shopping and feeding Bish, I donned my jogging gear and set out to run. Something else I need to update you on is The Sugar-Free Me Challenge. I’m well into it now, and I promise a proper update today or tomorrow. One thing I can say is that I’ve not lost weight. As I turned onto the main road, I felt heavier than I had when I jogged this route earlier in the year. This did not bode well. However, after my initial misgivings, I managed to run for 13 minutes without stopping. I was most impressed with myself. I was out for a total of 25 minutes, and probably 5 of those in total spent walking (which admittedly seems like a lot now!). When I got home, I felt like the cloud had lifted. Not totally gone, but put enough at bay to have some food and relax for the rest of the night. I still want to blog about what’s on my mind, but not yet. They say that patience is a virtue. If I blog when I’m down it shows in my writing. Out of all the titles you could possibly have expected me to pick for my first blog post in almost two months, I bet you didn’t expect to see the words “Jogga-Blog”. In fact, this is the fourth and fifth Jogga-Blog combined, because my first London-based jog occurred on Thursday evening. While afterwards I was most pleased with myself, the closest I got to blogging about the experience was thinking about it. Well, you know what they say, it’s the thought that counts. Today I was up early, so I decided to take advantage of the nice morning, before the heat became too overbearing, and take myslf off on another jog. Once round the park without stopping this time. I was most impressed with myself. You may be wondering why it has taken me so long to write another blog post since the publication of The Twelve-Week Challenge: Day 1. I’ll do my best to fill you in on what has happened in my life over the last seven weeks, and from then onwards I shall attempt to keep you updated on a more regular basis. I managed to find a lovely flat in West London, which I’ve settled into now. My “housemates” are slightly older than me, but it’s nice to be with people who are full of stories from their lives. I love listening to them talking, because it gives me inspiration for writing. While this is the first time I’ve put virtual pen to paper in some time, I’ve been jotting down notes in my mind. My little notebook that I use for my writing ideas got dusted off the other day, and I’m delighted to say that some of my ideas made it onto the page. But I finally feel like my creative juices are starting to flow, which makes me happy because the pipes have been clogged for some time. Now though, that all my university work is finished, I can write for pleasure, without having to worry about deadlines, and I am thrilled that my ideas may finally find a place in the world. It took me a while, but in mid-June I finally found a temp job, working in the Head Office of a high-end retail company. The office is located only four tube stops from where I live, so the commute takes around 30 minutes door-to-door, which is not too bad considering I work with people who commute up to four hours a day. The work is very similar to what I did in the NHS, analysing data, but instead of patients, it’s handbags and high heels. I had a job interview for a writing position for one of these Daily-Deal websites just before I was offered this post. While I was slightly disappointed not to have got the job, I think I’m coming to the conclusion that, for now, I’m happy with a nine-to-five job that I can do without having to stress out over it, where the people are nice and the commute isn’t too long. I can get work on getting my finances back into a manageable condition, and use my free time to do what I have wanted to do for so long: write. This job is temp to perm, which means it may become permanent in a few months. You may be wondering why I bothered to do a degree in American Studies, if I was only to get a job the same as what I was doing before. Well I got my degree results the other day, and I will graduate from the University of Lincoln in September with an upper second-class honours, or a 2:1. This is reflective of the work I’ve done over the last four years, and while last year I may have been disappointed not to have received a first-class honours, right now I am just glad to have made it to the end with some sense of sanity. When I started my degree, my life was very different, and what I want to gain out of a degree now is not necessarily the same as it was when I enrolled back in September 2009. While I would still love to have the opportunity to work in America, I am learning to pick and choose my fights, and the opportunities for someone like myself to make the USA my home are slim. What I’d rather do is focus on what I want to do, which is writing, rather than where I want to do it. Days like today, where the weather is 26 degrees centigrade (79 Fahrenheit), and the forecast for the next six days is much the same, I’m more than happy to be in London, which is like a little greenhouse full of heat, where I can spend my lunchtimes sunning myself in the park, and the early evenings in the garden. For now, life is good. This chapter is still very new to me, and I’m very much finding my feet. I’ve put on weight since my arrival, hence my desire to jog, and knowing that I won’t be able to afford to join a gym until possibly later in the year, I’m going to have to rely on my own resources and free exercise such as jogging and walking, in the tree-lined areas close to where I live and work. By the end of September, I will have graduated from university, signaling the true end of the previous chapter of my life; potentially have secured a permanent job, and have made myself financially stable. All the key ingredients for the basis of a happy life, on which I can build the foundations of the me I’ve wanted to become. Please join me as the journey continues. I’ve missed talking to you guys. Whereas yesterday was a busy and productive day, today has also been busy and productive, but in different ways. Yesterday I was involved in general ways to improve my life, by jogging and gardening, but today I have concentrated once more on the areas where I need to achieve results sooner. I did work on my essay, I have applied for several more jobs, both temporary and permanent, and have also made enquiries about a flatshare in London. Most of the people I have spoken to (family and friends) believe that I should wait to find a job in London before moving there. That would be the sensible option, but since I’m looking at temp jobs now as well, I don’t know how well viewed I will be seen by recruitment agencies trying to fill roles when I live 143 miles away. Having done temp work before, it’s quite possible that an agency will phone you up and ask you to start the next day. While I have a statement on my CV that I am willing to relocate “immediately”, the practicalities of this are somewhat not as conducive to this idea. Of course, it’s a huge risk moving to a big city where rent and bills will be at least double and possibly triple what I pay now, without having a job. But I do believe in taking risks, otherwise I wouldn’t be where I am today. The rebel in me thinks I should do the exact opposite of what everyone else says, because, of course, I know best. But do I? Everything I’ve been through in the last few years has taught me that you have to strike a very delicate balance between taking a risk and thinking things through carefully. Where the line is in this scenario is yet to be decided. You should probably be aware (and impressed) that this is the second blog I’ve written today. If you didn’t see Jogga-Blog No 3, then you can read it here https://33andlostinlife.wordpress.com/2013/04/14/jogga-blog-no-3/. After my jog, I went supermarket shopping with my housemate, stopping off at the hand car wash on the way to clean the car, got home, chatted with another visiting friend and housemates, went in the garden, mowed the lawn, did some gardening and even hoovered downstairs! I don’t know what’s come over me today. Maybe it has something to do with that warm, gorgeous sunshine! Anyway, today I was determined to do lots, and while it’s left me aching in places I didn’t even know I had places, I feel happy that I’ve achieved several things today. Anyway, I think 2013 is finally the year I acknowledged that I like gardening. Since I was 21 I’ve lived independently from my parents (except for the few weeks after I returned from studying abroad, which saw me back at my dad’s…thanks Pops!) and each house I’ve either owned or rented since then has had a garden. While I’ve begrudgingly gone out to do gardening in the past when the garden starts looking like a jungle, today I was desperate to get out into the greenery and the warmth of the sunshine. And you know what, I enjoyed it. I do come from a line of green-fingered sun-worshipers, so it’s hardly surprising. I guess I’m just surprised that it took me this long to realise that gardening gives me an opportunity to be out in this country’s sometimes (often) evasive sunshine. Today was really warm, and actually would have been warm enough for sunbathing, but I was determined to get at least some of the garden done. There’s less than half to go now, so it shouldn’t be too long before I can sunbathe in peace, and enjoy my days before I get sucked back into the working world I suddenly seem to desperate to be part of again. It’s a beautiful day! The sun is shining! Why I am so happy? I’ve been out for a jog, that’s why. No, not job (not yet), but jog. The other day I finally put batteries in my bathroom scales, hopped on and…when I finally picked myself up off the floor, decided that it really was time to do something about my weight. As I’ve probably mentioned before on this blog, three years ago, I lost a lot of weight in just a few weeks. I went from 10 stone 4 pounds (65.3kg/144lb) to 8 stone 3 pounds (52.2kg/115lb). While it was stress-induced, I felt great, and even spending six months in America while studying abroad, where they do love their burgers and portion sizes, I returned with only an additional 3 pound. Sometime between June 2011 and now, I’ve put on 2 WHOLE STONES. When I stepped on my scales the other day, I was 10 stone 6. My ideal weight for my height, 5 foot 6 inches (167.5cm) is 9 stone 10 pounds. I have never weighed so much in my entire life. Growing up I was always pretty underweight, and I liked it that way. I know I’ve been piling on the pounds, but I guess I didn’t realise quite how much until I weighed myself. It always goes to my stomach, and the amount of coke I drink, along with the Irritable Bowel Syndrome (IBS) I suffer from, has always given me a belly. Plus I’m a Cancerian, and they are apparently renowned for having pot bellies (I certainly can’t argue with that). So this morning, I woke up, decided that today would be my first jog of the year. Got dressed, put my Adidas London Marathon 2012 cap on (I’ve never run it, the cap was a freebie at a place I worked last year), strapped my iPhone to my arm with Michelle Branch playing and took off on my route. It was so warm out today that I knew I didn’t even need to wear a hoodie. While that meant my belly was on full view to everyone, I didn’t really care, because even wearing my jogging outfit, I feel slimmer already. I’ve been eating lots of fruit this week, and trying to drink more water, and less Diet Coke. This healthy eating is going to continue, along with a decided effort to cut the crappy foods out. I want to look great when I move to London. Whereas the huge weight loss from three years ago was caused by stress, usually stress causes me to comfort eat, so this was rather a one-off. To lose weight, get toned and look great, it’s going to take a lot of work, at a time when I already have a lot of other stuff to think about, but it’s time to kick this new me off with a bang.